Bill Gates started Microsoft with a dream of placing a personal computer in every home, and on every desk. But Larry and Sergey have even more ambitious dreams - they want Google software installed on every computer that's running Microsoft Windows. First, Google agreed to pay Dell a billion dollars who in return will install Google software on all new machines that leave the Dell Building. Now Google has signed a similar multi year agreement with Adobe to distribute Google Toolbar with Macromedia Shockwave player and other Adobe product installations in the future. What's In The Fine Print? Windows Vista, which is nearing launch, has MSN set as the default web search engine. Google realizes the emerging Vista threat and therefore is willing to pay billions of dollars to Dell and Adobe to distributes it's web search software in the form of Toolbar. Google win is a huge setback for Yahoo - Adobe is not likely to continue software-distribution relationships with two rivals at the same time. 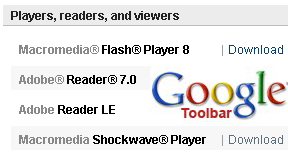 Adobe has replaced Yahoo Toolbar with Google Toolbar in their Macromedia Shockwave Player and we could expect the same treatment very soon in Adobe Reader where Yahoo software is distributed by default. While Macromedia Shockwave is installed on just 55% of the computers, Macromedia Flash player and Acrobat Reader are installed on almost every PC. So once Adobe starts to bundle Google Toolbar with these ubiquitous software, Larry/Sergey's dream will be very very close to reality. It's also possible that Google Toolbar will be bundled with Adobe Apollo, a Flash like runtime coming next year. Do you want fries with that ? Long term, we can expect to Google to create more alliances with other software and hardware vendors. Google already distributes software from Symantec, Adobe and Real in Google Pack. We may see a situation soon when every software vendor (in return of Google Dollars) begin to push customers to download and install the Google Toolbar just like McDonalds promotes French Fries with all ther products. The Shockwave file format is .DCR, and it is created by Macromedia Director while the Flash file format is .SWF, and is created by Macromedia Flash. Use Flash for interfaces to sites, for quick impact. Use Shockwave for more complex multimedia work, or for web applications that are beyond the browsers' abilities.